The holidays are such a great time to do craft projects. With the weather getting colder and family and friends all around it’s the perfect time to settle in and do something creative. The only problem is that with all the parties, cooking, and traveling it’s sometimes hard to find the time to indulge in the crafty aspects of the holidays. This project is the perfect antidote to the holiday time crunch. It’s quick and easy and requires very little sewing. 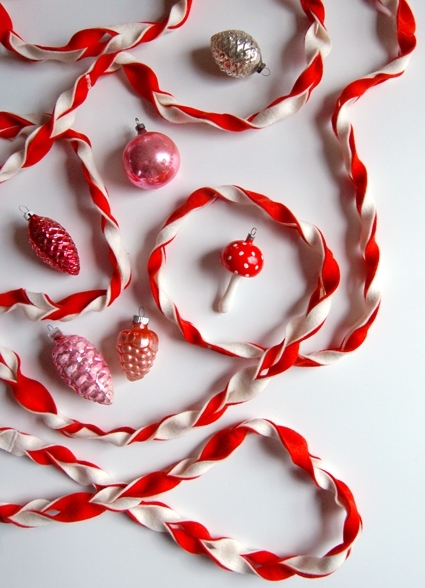 Best of all, using one simple technique, you can make a garland for holiday decorations as well as cute necklaces and bracelets for stocking stuffers! 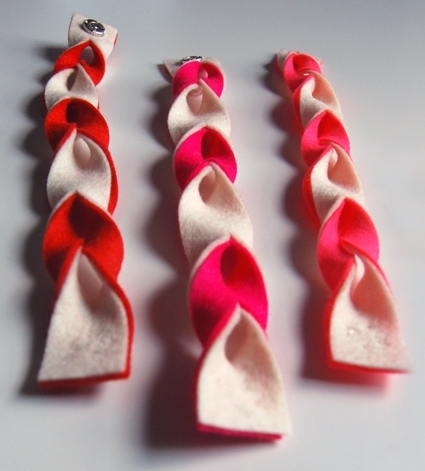 These garlands, necklaces, and bracelets, are made from our gorgeous 100% wool felt. Felt is the perfect material for quick but stunning projects like this because it’s so easy to work with and comes in the most vibrant saturated colors. 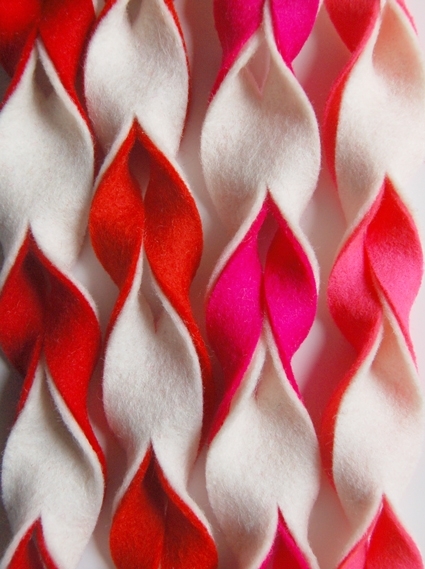 The technique used is super simple, just cutting some evenly spaced cuts along long strips of felt and then pulling the ends through these cuts. 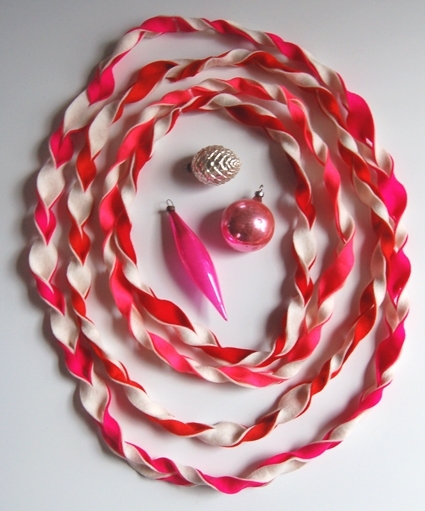 It comes together to look so festive and fun, especially in candy cane inspired colors like these. The garland will add a bright, modern, holiday touch to any mantle or tree and I can imagine giving the necklaces and bracelets out as party favors at a holiday party to get all the guests looking festive. In different colors this same technique could be used for all of the holidays around this time of year, in blues and whites they would make lovely Hanukkah decorations, and in black and white they would be a bold new years statement! 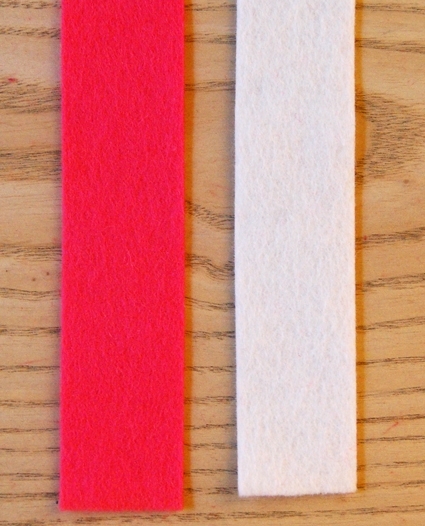 Using a rotary cutter, cut both colors of felt into 1-inch strips length-wise. You will have nine 1-inch by 72-inch strips. Try to do this carefully. There isn’t much to this project so it’s important that each step is done as neatly as possible. Start out by making a bracelet, since it’s the shortest and easiest piece and you won’t waste too much felt if you make a mistake. 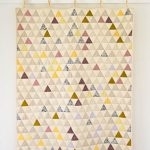 Cut a white and a colored strip to be 10-inches long and lay them down on top of each other so they match up exactly. Pin one of the short ends to keep them in place. 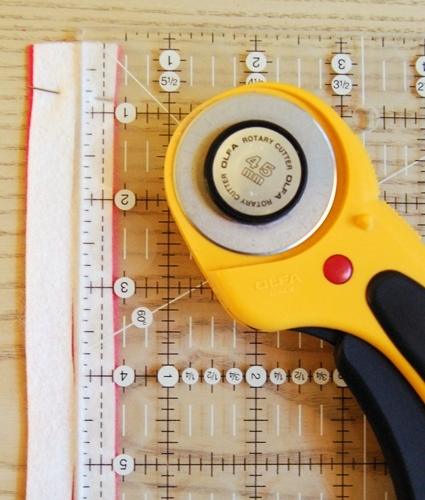 Starting 1-inch from the pinned end use your rotary cutter to make a 2-inch slice lengthwise across the middle of the strip (a 1/2-inch from either long side). Then make two more 2-inch slices, each 1-inch from the previous cut. Your bracelet will now be a 10-inch strip with three 2-inch slits cut down the middle, each 1-inch apart. Now it’s time to start twisting! Take out the pin at the end of the strips. They should stay together alright without it. 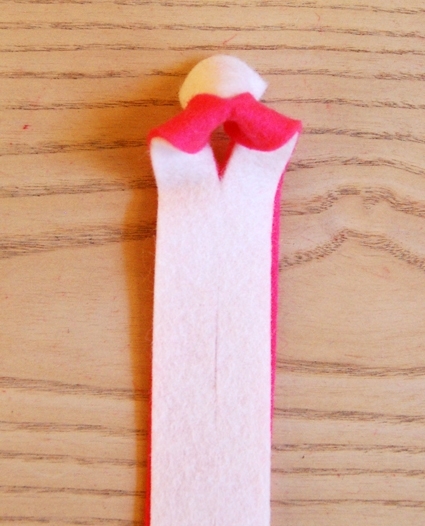 With the white felt facing up fold one of the ends into the nearest slit as shown above. 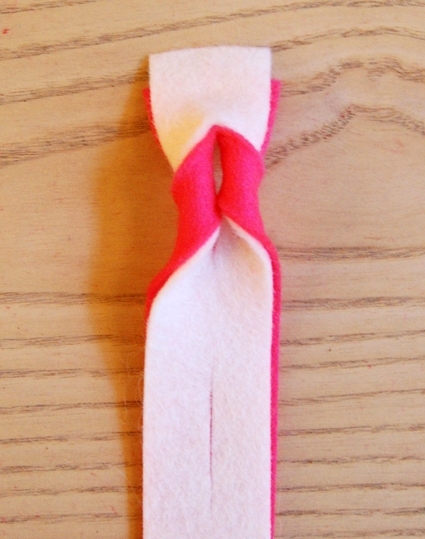 Pull the end through taught so that it forms a pretty “V” shape of the contrasting felt. Now pull the end through the second slit in the same direction to form your next little “V”. Repeat this for the last slit. Hand sew the snaps onto each each end. When cutting the slices into a longer strip only cut five slits at a time, twist them as instructed in the bracelet instructions and then cut then next five slits. 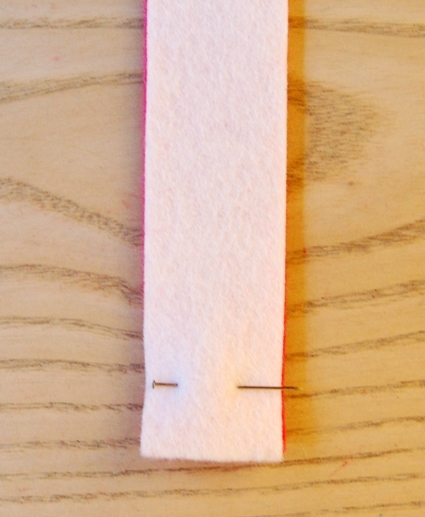 Be sure to always fold the end through the slits in the exact same direction, with the white felt facing up and turning through the next slit in succession. You will have to trim the ends a little more when you’re done twisting the strips because the longer the strips are in the beginning the more offset they will get by the end. To make to a garland you will twist three separate 72-inch long strips, Strip A, B, and C, across their entire length. 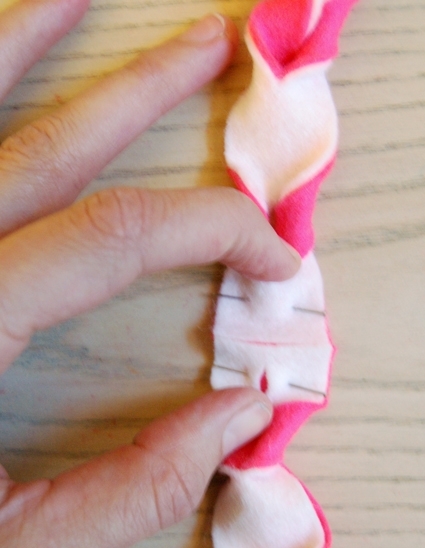 Trim the ends of each strip to be a 1/2-inch from the first and last slits. 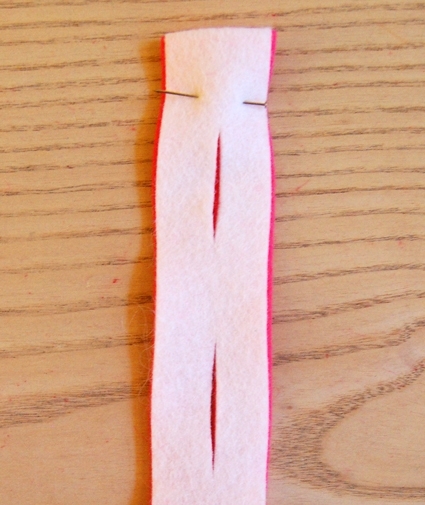 Then pin the top white strip to the bottom colored strip at the beginning and end of each strip to keep them in place. Place Strip A’s end flush against Strip B’s start. Make sure the “Vs” are going in the same direction. 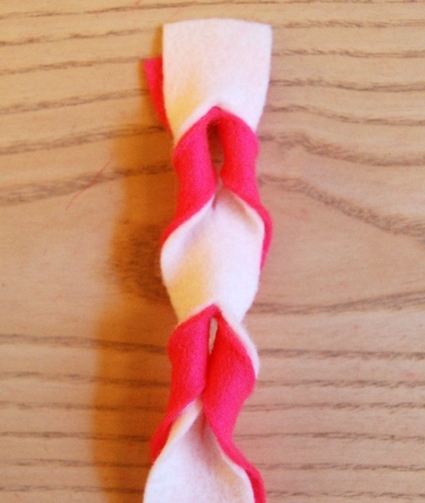 Zig Zag stitch Strip A to Strip B together where they meet. Repeat this to attach Strip B to Strip C and you’re all done! The garland will be approximately 6-yards long. Start with a 1-inch by 36-inch strip and cut and twist it just like the garland. Trim the ends to be 1/2-inch and zig zag stitch the beginning to the end, being careful not to twist it, in the same manner as the garland. That is such a simple construction but yields striking results. WOW! It's a great idea!!! I'll do it! Thank you for show it. These are so pretty and clever! Thanks! Oh My Goodness how do you think of such brilliant projects? It is amazing and so simple. Bravo! Oh that's so gorgeous. Off to get some materials now! Honestly, this is GENIUS! Thank you so much!!! Hi… no need to post this… but I thought you'd want to know that you used the word “taught” in the instructions, when, I believe, the correct word is “taut”. No big deal, really. And by the way, I love the craft! As a pet lover, the first thing I thought is that these would make great decorative holiday collars for dogs and cats. Thanks for the great tutorial! Brilliant…..My mind is racing….what else can I do with this technique? vintage fabric? 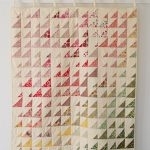 painted fabric? very very cool. Happy Jolly Winter to you. Oooooo I really love this… simple and cute.. and not fussy at all! Thank you so much for all your great ideas. It is very good of you to share them will all of us. All your tutorials are wonderful! Thanks! I am off to the shops NOW to get the maririals! so easy but so lovely! I love this! Went yesterday and bought the felt. I did all the cutting and my 10 and 7 year olds did all of the “twisting”. I sewed them end to end and we ended up with a 30 foot long garland and it is on the tree. Love love love it! Thank you so much. I am just now starting your tutorial. The picture you show has cuts that are 1 inch cuts not 2 inch cuts. Which measurement is correct? The written instructions are correct. You should do 2-inch cuts, 1-inch apart. just found these. awesome. they look like the polish chrustiki cookies i make.what a great idea!! I love these! Simple and beautiful! I was wondering if spray adhesive would work? I have a bit of a love affair with the stuff. 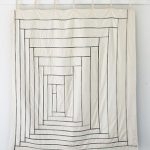 Considering that for the garland you suggest cutting and twisting 5 times before continuing, I'm concerned that sticking the two layers together and cutting into strips, then cutting the slits and turning would make things buckle too much? Thanks for getting in touch! It shouldn't buckle too much, the instructions for this are correct and are exactly how we made the finished garland in the photos. If I wanted to make this garland 3 inches wide would the slits still be 2 inches long or would they need to be longer to accommodate the wider felt? 3 inch wide strips with 2 inch long slits, 3 inches apart? Thank you so much for writing in! You could do it either way, it just depends upon how much of the contrast color you’d like peeking through. I recommend doing a couple practice pieces using different slit lenghts and inches apart until you find the perfect combination! Thank again and happy crafting! Love this .. Thank you so much for sharing your great ideas.